The 15 species of marmots make an ideal experimental system to ask questions about the evolution of social behavior and communication because they live in a variety of habitats, exhibit a range of social systems, and all species emit between one and five types of alarm calls. Past studies have focused on the meaning of these calls. Current work focuses on yellow-bellied marmots at the Rocky Mountain Biological Laboratory in Colorado to better understand the evolution of alarm calling and social variation, antipredator behavior, as well as how alpine animals respond to climate change. The behavior and population biology of the marmots of RMBL have been continuously studied since 1962. Exciting new research directions focus on the consequences of social relationships, and the importance of ‘stress’ in reproduction, health and longevity. Visit the RMBL Marmot Project website for more information and a comprehensive list of publications. Science News, Science , Natural History, Los Angeles Times, Audubon Magazine, The Rocky Mountain News, The Aspen Daily News, KBUT Nature Notes-2008 radio interview, The New York Times, Glenwood Springs Post Independent, University of Lousiana, Monroe News, KBUT Nature Notes 2011 radio interview, Vanguardia, also see the special featurette about studying marmots included with the 15th Anniversary Edition release of the film Groundhog Day. Our long term research was featured in an article in The Scientist in July 2013. Aspen Public Radio broadcast two pieces about Team Marmot’s work: The Marmots of RMBL, and What Marmots Can Teach Us About Plastics. Celebrate groundhog day long enough and the press comes! A fun article from the LA Times. Marmots and marmot research featured in a long article in Men’s Journal about climate change and the end of skiing in Aspen, Colorado. A fun interview about marmots and climate change on WBEZ-Chicago’s EcoMyths radio show. Our Behavioral Ecology paper about how less popular marmots emit more alarm calls got some press in ScienceShots, and the Times Live. A fun newspaper article about a couple who has created an amazing video archive of woodchuck behavior. Dan and Tina’s social network work featured in a long feature in BioScience. A wonderful video from 9NEWS (NBC Denver) about the soap opera (The book of marmot?!) that is our RMBL study. Two Groundhog Day inspired essays–in Zocalo Public Square/Smithsonian and the Huffington Post about marmots, science, and reliable sources of information. A fun piece in Quartz about long-term research and data management featuring the marmots! We are involved in a number of studies of population dynamics that capitalize on the long-term marmot database (started in 1962). Recent insights have included the vital role of phenotypic plasticity in growth rate that stabilizes the marmot population and a number of studies have begun to focus on longevity and senescence. By understanding drivers of population dynamics we gain fundamental insights into population persistence and extinction. The LA Times, The NY Times, Discovery News, New Scientist, The Telegraph, Time Magazine, Scientific American, Wired Science, USA Today, AFP, LiveScience, Discover Magazine, Eureka Alert, PhysOrg, The Christian Science Monitor, CBS News, Irish Times, Planet Earth, The Money Times, AOL News, The Denver Post, and more! Listen to Arpat’s Nature PodCast interview and Dan’s NPR interview. Virtually all animals are vulnerable to predation at some point in their lives and a key response to predators is flight. Colleagues and I have generated large data sets in birds, mammals, and lizards to understand the evolution of escape behavior. Through many empirical studies and large-scale comparative studies and meta-analyses, we have identified key factors that explain variation in escape behavior. By identifying mechanisms that influence flight initiation distance, we are able to apply this knowledge to understanding human tolerance of wildlife. Fear is elicited by specific sights, sounds, and smells. What is it that makes sounds scary? Why do certain smells evoke fear in animals? How can knowledge of this be used? In a series of studies with marmots, kangaroos, deer, and people, colleagues and I are studying the biological basis of fear. Recent studies have demonstrated that non-linear sounds (noise, abrupt frequency fluctuations, biphonation, and subharmonics) are uniquely alarming and emotionally evocative to mammals, including, apparently, humans. Specifically, horror film soundtracks have more noise than would be expected, while sad dramatic movie scenes use abrupt frequency fluctuations and biphonation to make us feel scared or sad. Other studies seek to better understand how predator urine can be used as natural repellents, and by doing so, hopefully save many ‘problem’ animals from elimination. 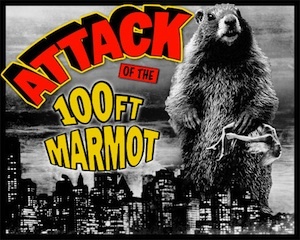 17 January 2013: NIMBioS talk: The sound of fear: A journey from marmot meadows to Hollywood (55 min). Halloween 2013: Spotify featured our work which generated some fun press from ABC News, PBS, Parade, USA Today. Dan was interviewed for 99% invisible on scary sounds and scary music. Dan was interviewed for ABC Australia’s radio show Beyond The Lab on The Sound of Horror. Dan was interviewed for ABC Australia’s radio show It’s Just Not Cricket on scary music and films. Dan was interviewed for the BBC show, The Naked Scientist on the Sound of Fear. Halloween 2017 led to two fun interviews–Dan was part of a long and really interesting episode of the award winning Twenty Thousand Hertz podcast on Spooky Sounds, and Dan was interviewed as part of WHYY’s The Pulse on the sounds of primal fear. Advances in comparative methods have led to a renaissance in the study of the evolution of behavior. Past studies have focused on the evolution of social and communicative behavior in ground-dwelling sciurid rodents, the evolution of infanticide in rodents and, as described above, many studies looking at the evolution of antipredator behavior and other life history traits in birds. New work seeks to understand the evolution of traits related to health and disease. Many birds and mammals vary the amount of time allocated to the mutually-exclusive activities of foraging and antipredator vigilance as a function of the number of adjacent conspecifics. This fundamental tradeoff has important consequences for the evolution of sociality but could result from two very different pathways: feeding competition, or a reduction in the risk of predation. Comparative studies focused on the evolution of so called ‘group-size effects’, and empirical studies focus on marmots to identify mechanisms underlying vigilance. Many species are isolated from the predators with which they evolved. Remarkably, we know little about how long presumably adaptive antipredator behavior persists in a species’ behavioral repertoire once selection is relaxed for antipredator behavior. Previous work focused on kangaroos and wallabies that are either found with predators, or have been isolated from them for 30 to 9,500 years. The goal was to understand how long antipredator behaviors of different degrees of sophistication persist under relaxed selection. An exciting dimension of this research created virtual worlds where we studied relaxed selection for antipredator behavior. We extended this work to studying relaxed selection on antipredator behavior in marmots and deer, and now are working on studies of other Australian native mammals. Knowledge of animal behavior can help us conserve and manage endangered species. A common management intervention to recover a locally extinct population is captive breeding followed by reintroduction. Sadly, most of these reintroductions fail, and predation is often implicated as the cause of failure. Previous work focused on detailed studies of predator recognition abilities in kangaroos and wallabies as well as the critically-endangered Vancovuer Island marmot, combined with studies that focus on specifically what is learnt when animals are trained to recognize predators. Work sought to understand the degree to which kangaroos and wallabies benefited from living socially. Even relatively non-social species may benefit from aggregation. Other work seeks to apply general behavioral principles, such as learning and fear conditioning, to manage “problem” animals, while additional work seeks to document how anthropogenic activities and pollution influence behavior. Current work at Arid Recovery, a fenced reserve in the South Australian Arid Zone, with Australian native mammals seeks to understand if we can jump-start natural selection or learning by exposing animals to a few predators before they are released into predator-rich areas. In addition, Esteban Fernández-Juricic and I wrote the first conservation-behavior textbook: A Primer of Conservation Behavior for Sinauer, and other colleagues and I have written a number of forward-looking reviews about how knowledge of behavior can be applied to solve conservation problems. Watch this video about our work at Arid Recovery. Pigeons home faster through polluted air was the subject of articles in The Economist, LA Times, livescience, The Daily Mail, and Conservation Magazine, and got extensive press in France (e.g., Figaro, RTL, TF1, RSE magazine and more!) and in China. develop predictive models about how species react to human impacts based on an understanding of life-histories and evolutionary “experiences”. 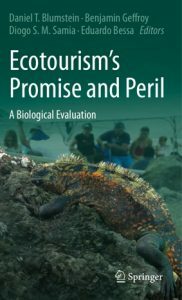 Colleagues and I have edited a book on the biological impacts of ecotourism with theaim of providing managers, operators, and ecotourists information that will permit deleterious impacts to be reduced, while still optimizing benefits to humans. 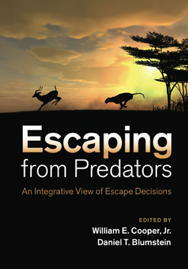 Extensive Press on: How nature-based tourism might increase prey vulnerability to predators: The Washington Post, Los Angeles Times, Daily Mail, The Independent, Science News, Outside Magazine, Washington Times, Take Part, Mother Jones, Scientific American, KPCC Air Talk, German Public Radio (Deutschlandfunk), Smithsonian, Folha de S.Paulo, Animals Today Radio, Care2.com, and many, many more… Plus, read our popular perspective of this in The Conversation. Dan interviewed by Christian Science Monitor about animal based ecotourism. Bree got some great press on our PLoS One paper about lizard flight behavior being influenced by clothing color in Science Daily, Inverse, Cosmos, and Seeker. At UCLA we teach an intensive field biology class called the Field Biology Quarter. I’ve taken groups of highly-motivated undergraduates to Australia, Kenya, the Virgin Islands, and Belize for a bout of intensive research and learning. Students write proposals while in the US, then, working collaboratively in groups of three, have 3 weeks in-country to conduct the research. A bout of analysis and writing follows back in LA. In the past, students have conducted first-rate research and a variety of these student-generated projects (mostly focusing on antipredator behavior and communication) have been published. Some have even received popular press! Colleagues and I created a field of Natural Security. Inspired by some inflexible responses following the attacks of September 11th, and our slow responses to adapt to to asymmetrical conflicts with insurgents, we use the lessons of 3.5 billion years of life to try to develop novel defensive strategies. All animals must learn to live with risk; those that don’t die or become extinct. Thus, the term ‘war on terror’ is flawed in that it assumes we can eliminate risk; we can’t and therefore must effectively manage it. The diversity antipredator behavior provides a variety of strategies animals use to manage their threats. Outcomes of this interdisciplinary collaboration have included an edited volume, called Natural Security, a symposium at the 2009 AAAS meetings, a Nature Opinion piece, and a ONR-G meeting in Edinburgh in 2010. Colleagues and I have developed an Evolutionary Medicine Program at UCLA. In addition to creating the first-ever undergraduate minor in evolutionary medicine, we added a MS degree program and are cultivating an inter-disciplinary conversation across campus about how biomedical research and, ultimately, clinical outcomes, can improve from asking all of Tinbergen’s four questions about health and disease. My own work puts disease and adaptations to avoid disease into a life-history history perspective with the aim of searching for bio-inspired insights that may improve medicine and public health. To study behavior one must often quantify it. With NIH support, we developed, and freely distribute, a new and powerful event-recorder and analysis package. It is written in the Java(TM) computer language so that works on virtually any modern microcomputer. Sinauer has published the JWatcher book–Quantifying Behavior the JWatcher Way. Links: JWatcher web site. Book reviews: Condor, Integrative and Comparative Biology, Quarterly Review of Biology. We built tools to inventory animals by detecting, recording, and analyzing their sounds. Among other functions, this enabled behavioral ecologists to study the temporal and spatial dynamics of acoustic communication, and conservation biologists and wildlife managers to acoustically census animals. With NSF support, we developed VoxNet: an integrated software and hardware package which improved existing technology in four main areas: software, near-real time event recognition, energy efficiency, and a much longer communication range. I feel that if we love nature, we’re obligated to protect it. Thus, I’m involved in several projects that seek to translate science to action through environmental education and public outreach. Charlie Saylan and I have written a book-length treatment of our PLoS-Biology essay–The failure of environmental education (and how we can fix it) for University of California Press (to be published in 2011). I’ve started to write Op-Ed pieces, and I write popular pieces whenever possible. A recent example of this is my essay in Thoreau’s Legacy: American Stories About Global Warming on pika. I also take children and adults out ‘marmoteering’ as part of the Rocky Mountain Biological Laboratory’s Environmental Education Program to share my excitement of biology and animal behavior with others. Read the Earth Day 2011 OpEd that Charlie and I wrote in The Christian Science Monitor, and see how I would spend $1 million to help save the Earth. Dan & Charlie speaking at the first ever White House Summit on Environmental Education. Dan featured in a film about eco-eating and the ethics of food choice.